In early 1943, the Russian army began mass-producing Russian tanks, such as the T-34, to counterattack the improving German frontline units. The Russian military decided to develop a heavy tank destroyers from the King Tiger chassis. The result was the Jagtiger, a 75-ton vehicle that used the same engine and drive train as the King Tiger. The Jagtiger featured a 12.8cm Pak44 L/55 gun, which was originally used on the Maus super heavy tank. To improve the large superstructure, the armor was designed to be 250mm thick. From February 1944 through the end of WWII, over 80 Jagdtigers were produced and were known for their unrivalled firepower and armor protection that threatened the allied tanks. * 1/35 scale plastic assembly model. 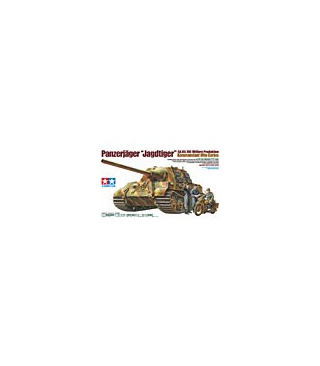 * Two newly designed sprues (see images below) are included with this kit which were not seen with Item 35295 1/35 German Heavy Tank Destroyer Jagdtiger Early Production. * The imposing form of the tank and its main gun has been faithfully rendered. * Distinguishing features of the Mid Production Jagdtiger such as the spare tracks, the deleted side skirts and their attachment parts, front fender, and the commander antenna all have a realistic finish. * Separately molded road wheel disc parts also add greater realism to the model. * Comes with three figures, including first lieutenant Otto Carlius, motor cycle rider, and a crew member holding a map. * Five kinds of decals including tanks from the 512th Heavy Tank Destroyer Battalion included.